In order for RFID readers to do more than simply read and act as a data conduit, they need processing speed and ample memory. 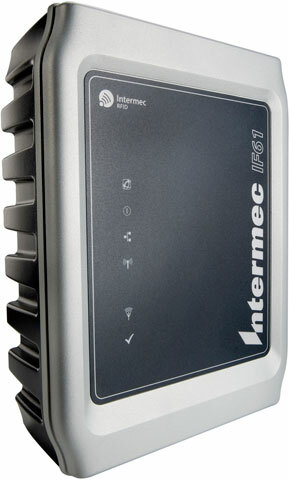 With the powerful combination of an Intel Celeron M 600 MHz processor and up to 1 GB of optional memory, the Intermec IF61 Enterprise Reader is the smartest RFID reader available, capable of running complex RFID applications, delivering faster processing and localized intelligence. When the host system or electrical power fails, the ample storage resources, and "store and forward" capabilities of the IF61 ensure that data won't be lost, even in the highest tag volume environments. In fact, with the optional spinning drive installed, the IF61 can store over 6 billion EPC tags. When applications are mission critical and "re-work" isn't an option, the IF61 can be counted on. The IF61 can perform all of these tasks without extra expense, and potential point of failure, of seperate industrial PC often rquired by other RFID reading solutions. Additionally, the IF61 includes powered general purpose input/output (GPIO) circuitry, which allows direct monitoring and/or controlling of peripherals such as presence detectors and signal lights without requiring extra devices and power supplies to facilitate the connection.